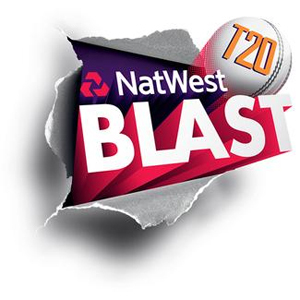 NatWest T20 Blast 2015 prediction, preview and betting tips. Two teams in the North Group of NatWest t20 Blast 2015, Yorkshire and Northamptonshire, are fighting hard to improve their position and will be in the park next. Middlesex along with Gloucestershire will clash in the coming match and require a hard work if they want to show their existence in the NatWest T20 Blast 2015. Two teams shivering at the bottom of the pool in South Group of the NatWest t20 Blast, Sussex and Surrey will enter the next game to upgrade their position. The no. 6 and 7 teams of South Group in the NatWest t20 Blast, Glamorgan and Somerset, with equal points from four games will go into field for their prosperity. Two strong units among ruling three in South Group of the NatWest t20 2015, Kent and Hampshire, are destined to meet again in the next encounter of the event. The top team of North Group in the NatWest t20 Blast, Durham, will enter the next game against no.6, Worcestershire, and will try to maintain their supremacy. Two teams among top four in North Group of NatWest t20 Blast, Warwickshire and Nottinghamshire, will meet for the 2nd time in the event to assess their weight. The 5th ranked team of South Group in the NatWest t20 Blast, will face the bottom line unit, Surrey, in the next game and both will try to lift their position. The team with a poor performance in North Group of NatWest t20 Blast 2015, Northamptonshire, will try to open their account when they meet Leicestershire next.